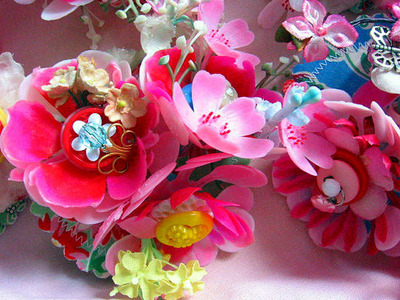 I spent a good deal of Memorial Day using vintage plastic flowers and vintage millinery flowers as the main feature of these corsages or flowers pins, if you prefer. 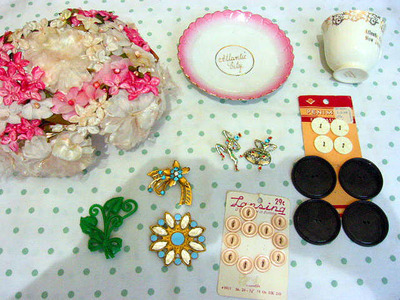 I took the plastic flowers apart and with floral wire restrung the pieces combining them with the vintage millinery flowers, vintage buttons, glass beads, charms, and bits and pieces of vintage costume jewelry which needed a new purpose! I made a half-dozen of these little beauties. I made three flowers stems for each corsage and wrapped the stems together to make a very lush display. I stuck with a pink and red color scheme using other colors as accents. A rhinestone earring piece adorned this pale pink corsage for a surprise bit of sparkle! I drew the stems through a small slit in two pieces of interfaced fabric--some vintage some new--which a trimmed with scalloped-edged pinking shears. 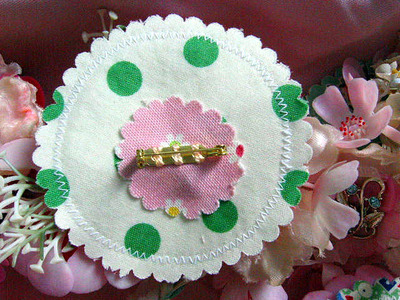 Then I glued a fabric disc over the wire ends after I sewed a pin back to the fabric. I usually sell my creations on eBay, but I'm going to be opening an etsy shop very soon! 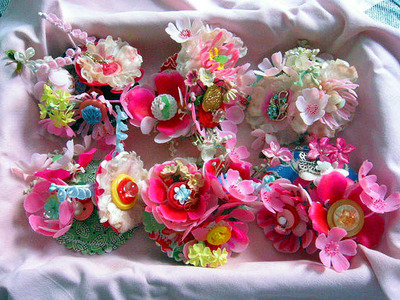 These corsages will adorn my one-of-a-kind vintage barkcloth totes. I'll put those exclusively in my etsy shop. This is quite exciting! I've never "etsied" before and look forward to it! 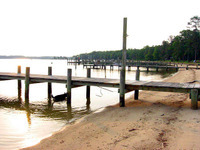 We travelled the 3 plus hours to Virginia's Northern Neck to the family cottage on a river off the Chesapeake Bay. Such a wonderful weekend! The weather was perfect! It had been a long time since we had a Memorial Day weekend with such Summer perfect temperatures! 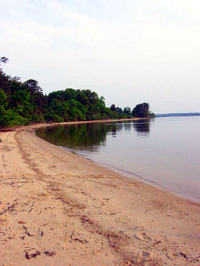 The beach was warm and sunny. 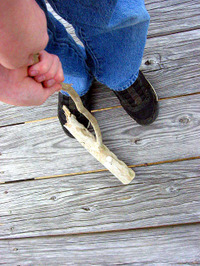 My son decided a piece of driftwood was best used as a golf club. 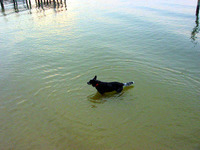 Our dog couldn't resist spending time in the water just walking around and around. 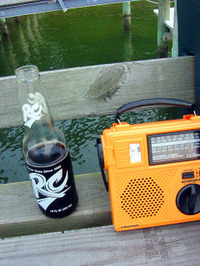 Old fashioned bottles of icy cold RC Cola, a radio you need to crank to make it work, a wise owl keeping seagulls at bay, and metal lawn chairs which are too rusty to sit on but are so nice with their blue color they are worth keeping--the cinder blocks keep them from washing away if the tide gets too high. 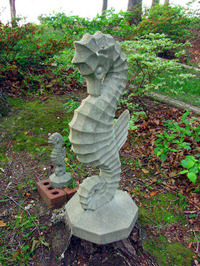 Concrete seahorses keep watch over the garden. My aunt's gold sandals on display beside a pot of impatiens and coleous. 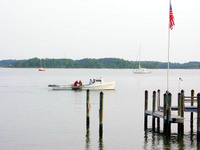 Crabbers retrieve their crab pots from the river on a calm early morning. 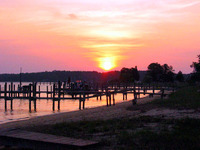 Early in the morning the beach captures the sunrise~~I just love waking up before everyone else and having the river to myself. 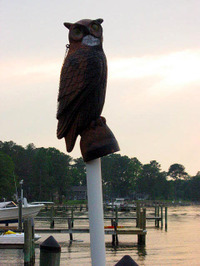 Later it will come alive with a hive of activity on the water of speedboats, jetskis, sailboats, and waterskiers. Now, I couldn't end this Memorial Day post without showing off~~forgive my bragging~~what I fou8nd at the numerous yard sales we encountered out in the country side. Here is a sampling! I adore the fabric with it's sea green flowers! 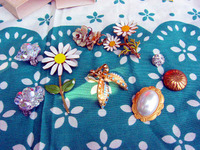 I found quite a few pieces of vintage jewelry to use on my bags and pin cushions. 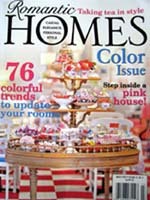 I love the fun ice cream colors of the candle holders. I have a few ideas for those. The metal church from Ulm, Germany will join other metal souvenir buildings in my collection. 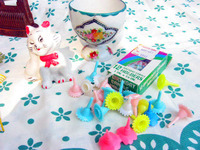 The kitties will wind up decorating pin cushions. The "sugared" flowers will adorn gifts one day, but for now I'm enjoying them in a vintage pitcher on my book shelf. 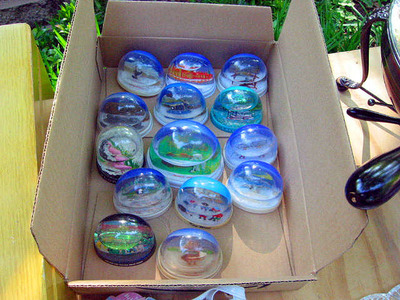 I'm not sure what to do with the vintage baby shower gift enclosures, but I'll think of something! 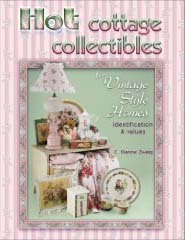 I hope you all had a wonderful weekend and found lots and lots of treasures! Today I had a few errands to run and one of them was very close to my neighborhood antique shop. One of the dealers was having a great sale and I took advantage of it! Take a peek at what I found today! 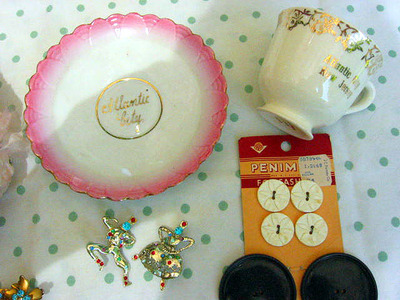 The Atlantic City teacup and saucer will be put to good use as homes for my pin cushion creations. The buttons--of course I'll pop them on pin cushions or totes! 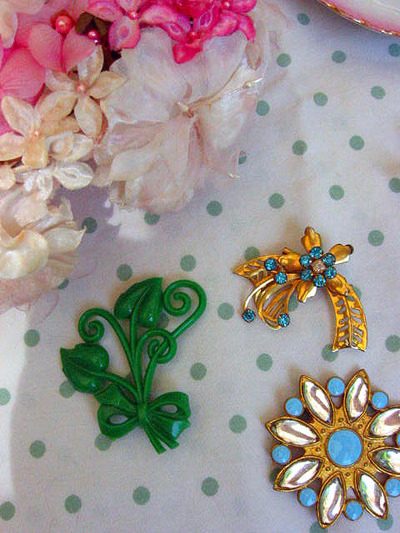 The brooches--the green plastic one is my favorite!--will adorn one of my totes. Gosh! I can't belive I've made about 900 totes over the past 8 years! 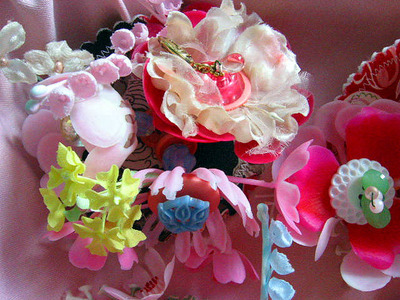 AND the millinery flowers of the hat will embellish pin cushions too! Made over 300 of those too. My, how time flies! Here's my big purchase of the day! 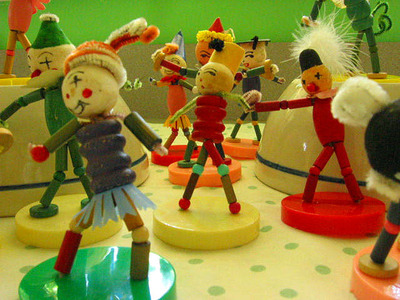 I couldn't believe the bargain I got on these chenille and bead cake decorations. One dollar EACH! I just about passed out. Isn't this a wonderful assortment? There are thirteen of them!! A Baker's Dozen! They are all in great shape too. The colors are just wonderful! I've never seen a happier crowd! 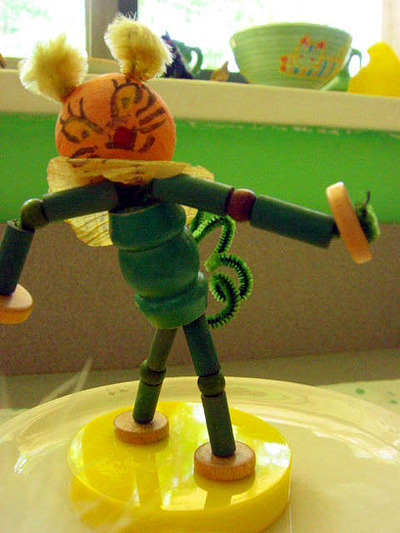 This crazy rabbit is one of my favorites! 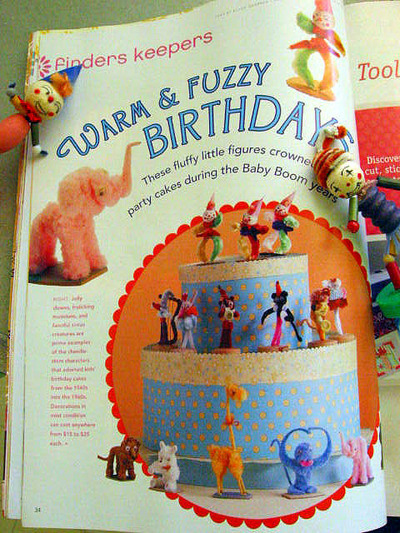 When I saw these chenille and bead critters in the store today, I hastily remembered my copy of ME Home Companion. 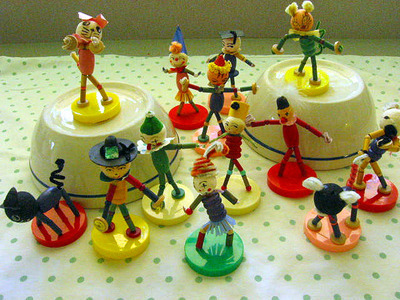 Now, my critters aren't 100% chenille, but I think they might have been made in the 50's or early 60's. They have their own special charm! Here's to very happy hunting this holiday weekend! Wear sunscreen! Do I have to tell you my age? How about we do it this way. My first record was a 45 rpm of The Beatles "She Loves You". I remember when Neil Armstrong and Buzz Aldrin stepped on the moon. Judy Blume was my hero in middle school, and the Bee Gees were super popular when I was in high school. In college my hair looked like that guy from Flock of Seagulls. I typed my master's thesis on a Brother Electronic typewriter with a one-line memory. I wanted my wedding to be like Princess Diana's. I've been married almost 21 years. My son is twelve. 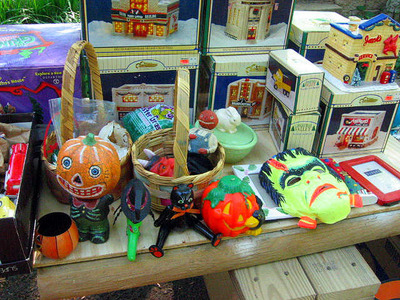 I'm spending the day haunting thrift stores, doing my own thing until hubby and son come home from work and school. It's going to be a wonderful relaxing day culminating with real birthday cake (yellow cake and buttercream icing) and Chinese food! Tomorrow I go back on my diet. Sunday Morning Post Yard Sale Trash Find! 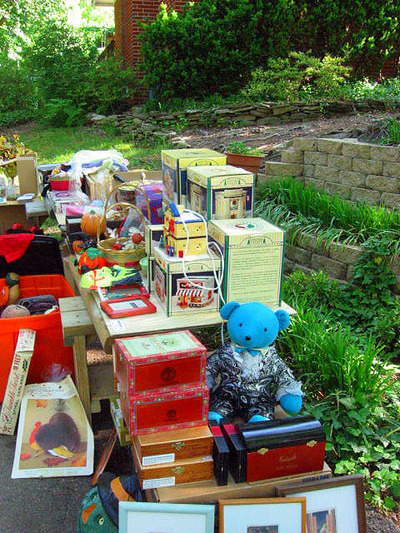 The only problem with having a yard sale, is not being able to go to yard sales. I wish I had visited one particular neighbor's house on saturday, but alas I didn't. HOWEVER, this sweet little lady placed a few small boxes on her curb. I happened by, taking down the signs, when I spotted pink. I stopped and hopped out. It can be a little embarrasing to dig through trash in one's own neighborhood in broad daylight, but it was early enough and besides I saw PINK! This is what I dug out of her boxes. If this is what she threw away I don't even want to think what I missed in her yard sale! 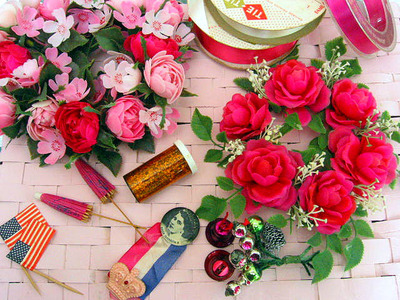 Ribbon, stunning plastic flowers, glitter, paper flags and unbrellas, teeny glittery hoiliday bells and baubles~~~OH MY! 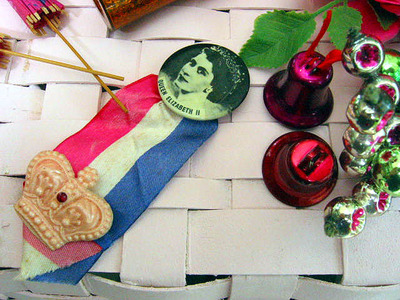 This pin with pink crown of Queen Elizabeth is really cool! In fact THE QUEEN was visiting in my area over a week ago. My parents were at the airport when she came in, and my mother swears the queen waved at ONLY her through her limo. Mom says she saw the white glove. 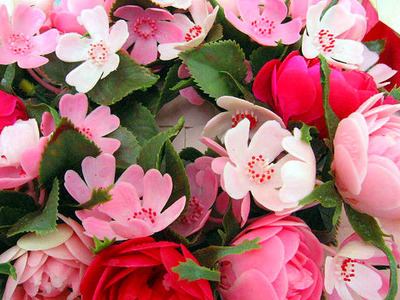 BUT look at these lush plastic blooms! I'm going to do something with them. I have a few ideas simmering in the grey matter. Stay tuned. 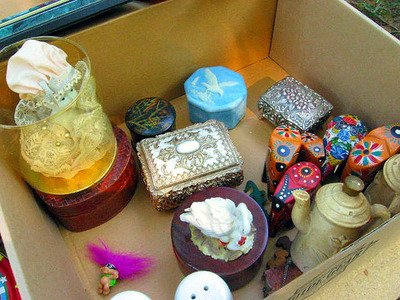 Here's hoping you'll find some wonderful "trash treasures" out there. If you do, let us all be pea green with your finds! 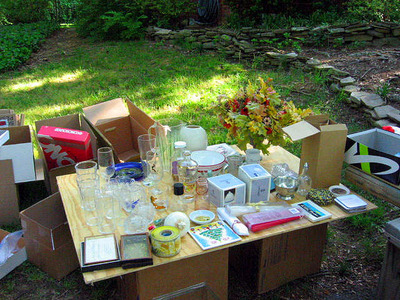 Our Yard Sale~~Today~~Lots O' Stuff! I was up at 4:45 this morning so I could have time to send email and talk to my BFF Suzy on the phone. Oh yes, she was up at 5:15 a.m. and on-line. I called her on her cell. She is one of the few people in the world who I want to begin my day talking to. After we chit chatted, we bid our good-byes because we were both having yard sales today! 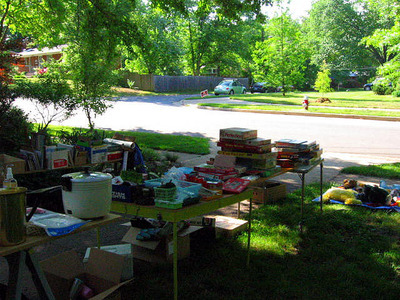 We live 3 hours away from each other, and we were thrilled that the weather was going to be great for both of our neighborhoods which were both hosting neighborhood-wide yard sales. 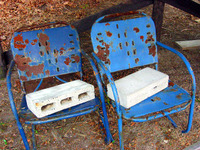 So, at 6:15 I started, with a HUGE amount of help from my dear hubby, hauling stuff outdoors. I couldn't believe how much stuff we had! Here are a few pics of our sale (they were taken around 8:30, and yard salers had been there for over an hour before so there's alot of stuff already sold by the time I could pull out the camera). These are the breakable things. By the end of the day most of them were all gone! My dad donated lots of cigar boxes. I sold them all for $1 each! I got rid of lots of Halloween stuff and these lighted houses. Here's our neighbor's boy with his purchase! He said he was going to scare his little sister! As you can see it was very shady in the morning. But as the day wore on the sun came out in full. By 1:30 when we shut down it was toasty hot! Don't tell Suzy, but I put the rice cooker she gave me in the yard sale and sold it to the oldest woman in the world for $4. Lots of dogs came by to visit. Our dog, Sheila, went crazy on her bench by the living room window every time we had a four-legged guest. 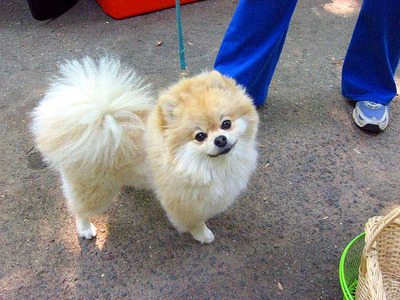 Here's a neighbor's sweet Pomeranian! The teeny troll looks out of place with the boxes and other misc. goodies my Mother-in-law donated. The elephants herded off with a sweet couple who are decorating their home in an Indian/Bollywood theme. The woman showed me her henna tattoo on her hand, but did I have my camera ready? Noooooo! 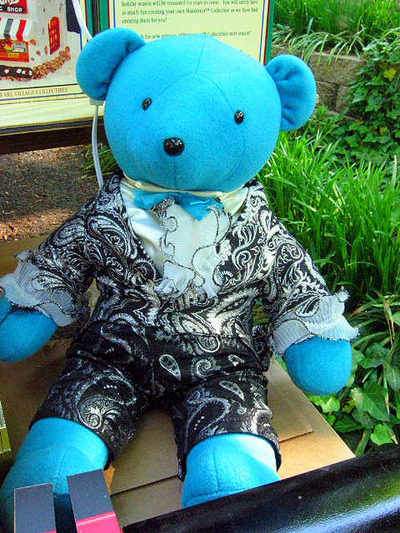 At the end of the day this fancy bear, from my late grandmother's house, didn't sell. I offered it to one of the neighbor girls and she danced away with him. I know her mother was thrilled to have ANOTHER stuffed animal in the house! I hope you all had a great day! 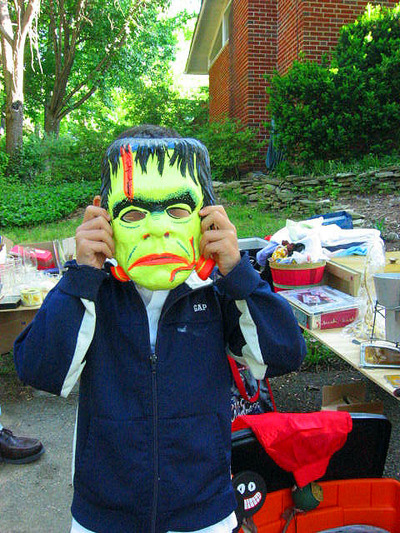 Let me know what you found yard saling today! I've Been Tagged~~Dang, I'm It! I got my first tag today from Prontip. 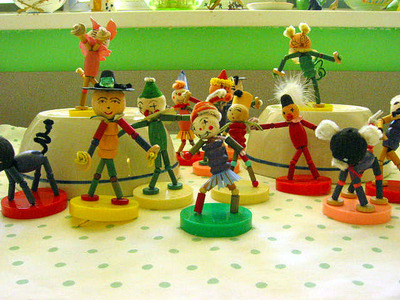 I am supposed to tell seven little oddities about myself. Only seven???? 1. I am scared to death of flying. I have flown. Across the Atlantic three times and over the Pacific once. I am terrified so much that I hate going to airports. I wish I wasn't scared. 2. My only other big fear are snakes. Obviously I've never seen the movie "Snakes on a Plane." My neighbor said she saw a huge black snake the other day on her walk thorugh the woodsy park at the end of our street. That's it for me. No more park until November when those snakes are hibernating! 3. I have to have Diet Coke, instead of coffee, for breakfast. I love the cold and the fizz. I have never had a cup of coffee in my life. When I have to go to Starbucks with friends who like it there, I order iced tea. 4. My favorite song, the one that always makes me want to dance or sing along very badly is: "Mexican Radio" by Wall of VooDoo. I know the whole thing, note by note, by heart. The "eating barbequed iguana" line is pure gold. 6. I hate wearing dresses. I'm a blue jeans and cute top sort of girl. I can't remember the last time I wore a dress. 7. If I've been to a restaurant before, I order the same thing from the menu everytime I go back. My BFF Suzy knows this better than anyone and it drives her CRAZY! So, I need to tag more people. OK, here goes. Sorry, Ladies, but you have to play now because you are IT! 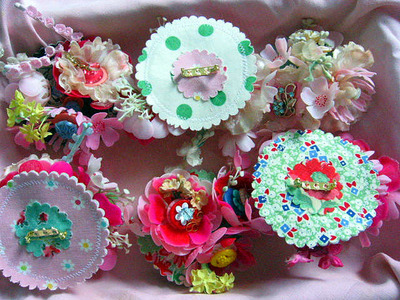 New Pin Cushions on a Balmy Day!! I love photographing my creations outdoors on our deck which is loaded with plants. My husband says he wants to powerwash and stain the deck, but everytime he looks at all of the plants, I think he changes his mind. 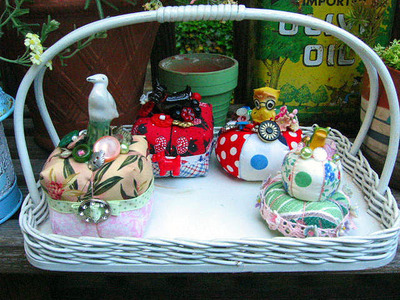 Anyhoo, I photographed a quartet of pin cushions for spring. They are on my eBay selling page Beth's Bagz. I particularly like the little frog. He's so tiny! Happy Mother's Day Everyone!~~Something Sweet! 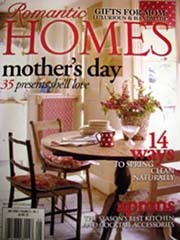 Happy Mother's Day to all of my blogland buddies who are Mom's to two-legged and four-legged "children!" 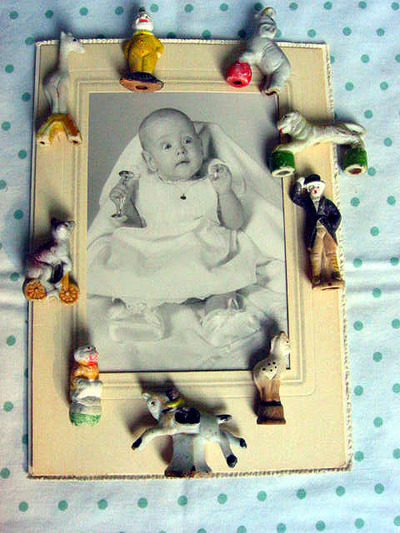 Yesterday I had a long morning of yard sales, which yielded one cute vintage dog brooch and a box of Chirstmas ornaments for my BFF Suzy. My husband went with me and he was happy that I didn't spend money willy-nilly. I told him I only get "useful" stuff. He didn't find anything useful either, like another tool he doesn't need, BUT he did let his eyes linger on a wrecked up go-kart, and if we had his truck instead of my Beetle, I bet that go-kart would be in our backyard right now! In the afternoon, hubby went to see his mother and I stayed home. 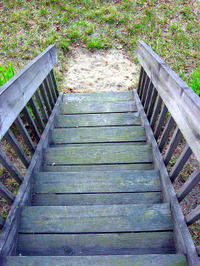 I spent some time on the back deck reading Fannie Flagg's latest book Can't Wait To Get To Heaven. One of the wonderful characters kept talking about this Caramel Cake she loved. I was getting hungry for that cake! I flipped to the back of the book and Ms. Flagg had included recipes and the first one was for caramel cake! I had all of the ingredients on hand and decided right then and there to make a Caramel Cake! One part of the recipe said to put the batter in "a pan." I chose a 13x9 pan, and as you can see I should've chosen an 8x8 pan. This is one flat cake! It's only an inch tall! But let me tell you that it turned out very tasty. It has that rich old-fashioned taste of brown sugar in the recipe. The icing is a teeny bit crunchy as there's brown sugar in it too. 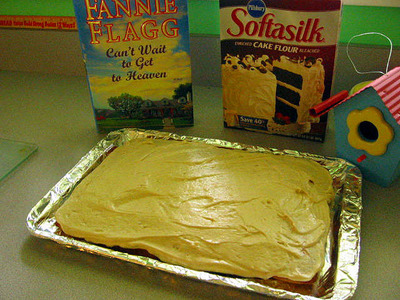 So if you want to make your own Caramel Cake~~~So Yummy!~~~check out Fannie Flagg's Can't Wait To Get To Heaven on Amazon or your local library. This is one hilarious story! I have read every one of Ms. Flagg's novels and love every one! 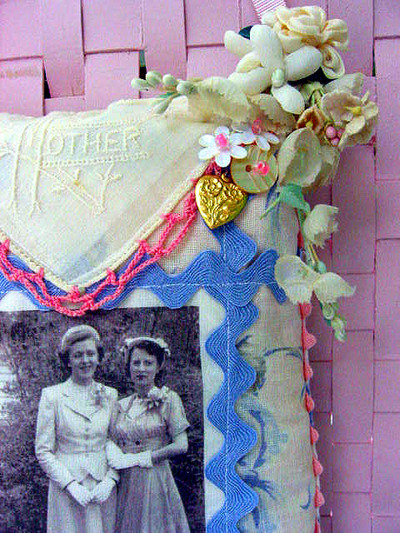 Sewing for Mom and Something Yummy Too! I spent thursday morning making a little something for my mother, which I mailed that afternoon. I know she'll get it in time for Mother's Day! I took a wonderful photograph of my mother (on the left) and my grandmother taken in about 1952 when my mother was a senior in high school. I ran the photo through the photocopier printing it onto June Tailor fabric printer paper. 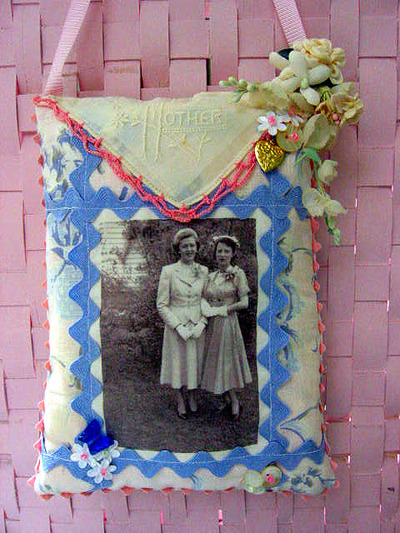 I sewed the fabric photo to a "pillow" of vintage feedsack from a cutter quilt my grnadmother had made. My grandmother inherited the sewing gene from her mother who used every scrap of fabric she could to make quilts to, in her words, "keep the babies warm." The faded, torn quilt was given to me by my mother who thought I could find a use for it. Little does she know that part of it will be given back to her! 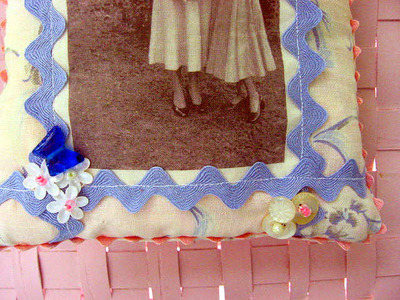 My grandmother used rick rack to decorate the dresses she made, and the blue rick rack was some of hers. 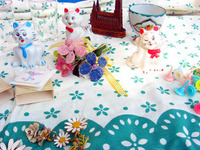 The "Mother" embroidered hankie corner is one of my flea market finds. 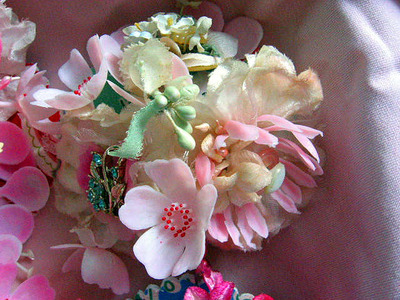 The vintage millinery flowers give the little pillow a nice, feminine touch. I bought the heart charm from Speckled Egg. 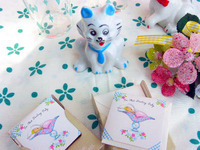 I bought the glass blue butterfly from Speckled Egg too! 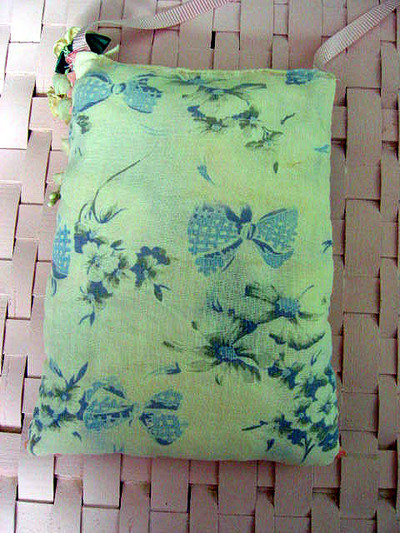 Here's the back of the pillow, which I filled with cotton batting and lavender buds. You can see how shabby sweet the vintage faded feedsack is! HAPPY MOTHER'S DAY! Now for something YUMMY! Today I took my favorite savory dish to my son's middle school for the Teacher Appreciation Luncheon. I made TWO Hash Brown Casseroles! Here's the recipe! It is super easy and perfect for a breakfast buffet, luncheon, or dinner--any time! This recipe is adapted from Aunt Bee’s Mayberry Cookbook. 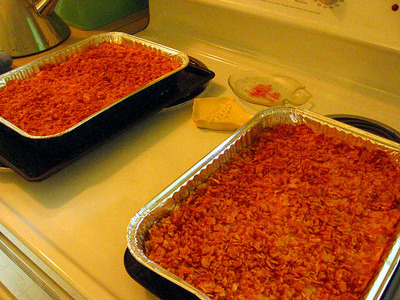 Grease a 9 x 13 inch baking dish or pan. In a large bowl combine the cheese, soup, sour cream, ¼ c. of the butter, salt and pepper. Mix well. Fold in the thawed hash brown potatoes. Turn the mixture into the prepared dish. Toss together the corn flakes and 1 T. melted butter. Sprinkle over the potato mixture. Bake in a 350 degree oven for 1 hour, until the casserole is golden brown and potatoes are tender. Serves 8 to 10.